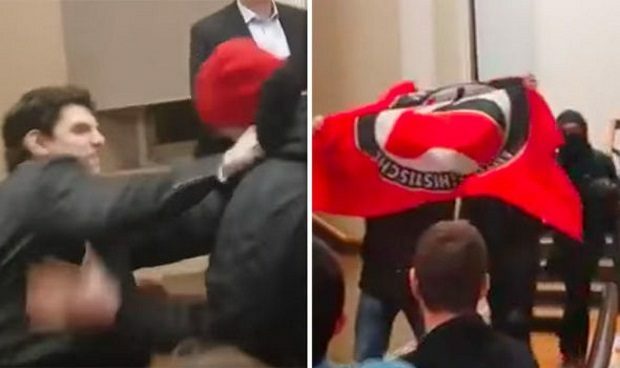 In scenes reminiscent of Nazi thugs smashing a Jewish shop in Berlin, Antifa an allegedly antifascist organisation dedicated to the intimidation and silencing of political opponents, broke up a public discussion about freedom of speech between Sargon of Akkad and Israeli Professor Yaron Brook of the Ayn Rand think tank at Kings College London last week. Wearing balaclavas and equipped with megaphones, they overturned the speakers’ rostrum, smashed windows and left notes threatening the organisers. With many of the audience plainly terrified the building was cleared.